Parenchyma, collenchyama, and sclerenchyma are three types of simple, permanent tissues, collectively called ground tissue in plants. Simple tissues are made up of a single cell type, which forms a homogenous, uniform cell mass in the body of the plant. Parenchyma is the most abundant type of cells in simple tissues. They are isodiametric cells containing thin cell walls. Parenchyma cells are found in all organs of the plant, seeds, fruits, flowers, leaves, stems and roots. Collenchyma cells consist of unevenly thick cell walls. They contain vacuolated protoplasts and are absent in monocots. Sclerenchyma cells are dead cells at their maturity, containing the thickest cell walls. They are specialized cells found in mature parts of the plant body. The main difference between parenchyma collenchyma and sclerenchyma is that parenchyma cells are involved in photosynthesis, storage, and secretion, while collenchyma cells are involved in support and transportation of nutrients and sclerenchyma cells are involved in the support, protection, and transportation of water and nutrients. Parenchyma is one of the simple, unspecialized cells of ground tissues, forming the bulk of the cell body in non-woody structures of the plant. It contains living cells, which are typically soft and succulent. Parenchyma cells are meristematic in their maturity and found in each part of the plant like leaves, fruits, bark, flowers, pulp and pith of the stems. Since they are meristematic, they are capable of entering into cell division when stimulated. Epidermis lacks parenchyma cells. Parenchyma cells contain flexible, thin cell walls, which are made up of cellulose. They exhibit nearly a polyhedral shape when tightly packed. But when isolated, they are round in shape. Central vacuole of the parenchyma cells stores water, waste products, and ions. Parenchyma cells in leaves from the mesophyll and are involved in the photosynthesis. Root parenchyma cells store starch, fats, proteins and water. Parenchyma cells in tubers and seeds also are involved in the storage of nutrients. Parenchyma in a plant stem is shown in pale gray color in figure 1. The scattered veins are shown in dark red. 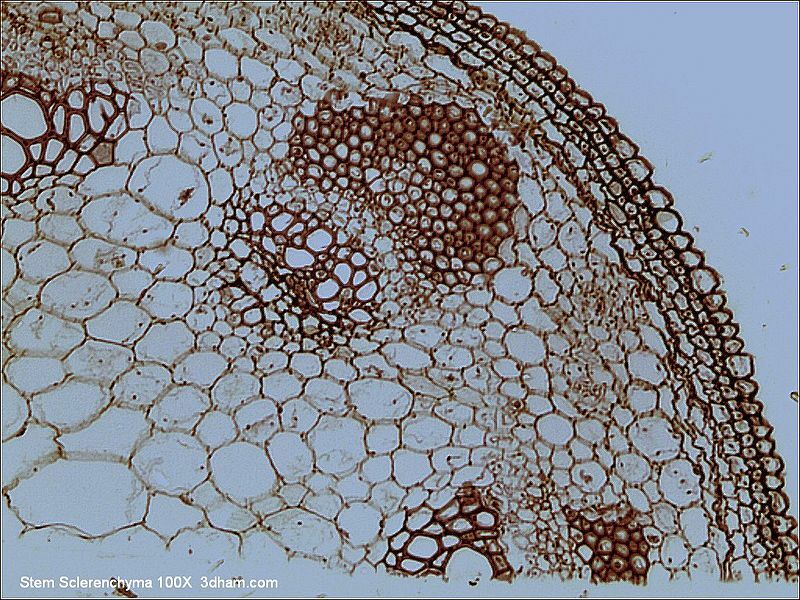 Collenchyma cells are the second type of ground tissue found in plants. They are also living cells, found in sub-epidermal cells. 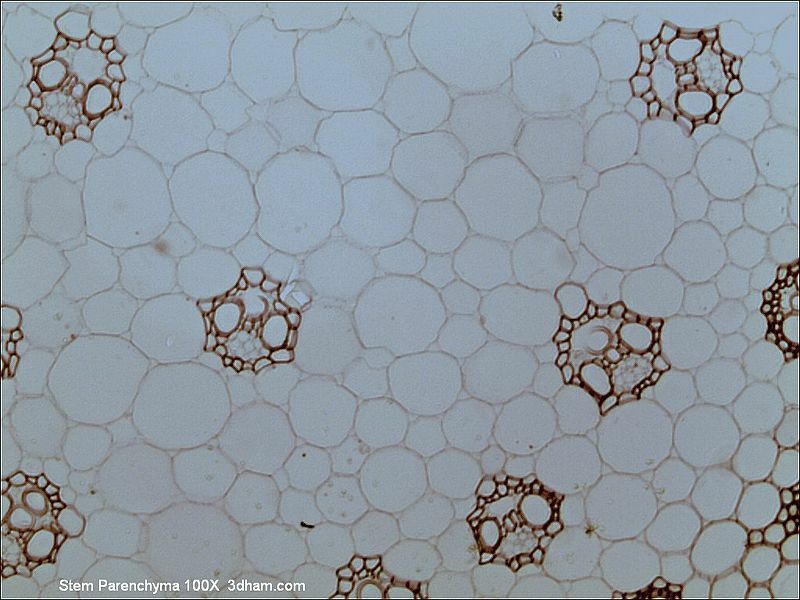 The cell wall of the collenchyma cells is unevenly thick due to the deposition of cellulose and pectin. Pectin is deposited at the corners of the cell wall. Collenchyma cells are polygonal in shape and found in young parts of the plant body like petiole, stems, and leaves, giving the strength and plasticity to those parts. Photosynthesis occurs only if chloroplasts are present in these cells. Monocots lack collenchyma cells. Four types of collenchyma are found based on the thickening of the cell walls: angular collenchyma, tangential collenchyma, annular collenchyma and lacunar collenchyma. Angular collenchyma cells are thickened at intercellular contact points. Tangential collenchyma cells are found in ordered rows, thickening in the tangential face of the cell wall. Annular collenchyma cells consist of uniformly thickened cell walls. Lacunar collenchyma cells are found in the intercellular spaces of the plant body. Angular collenchyma is shown in figure 2. Sclerenchyma is the third ground tissue found in plants. Cell walls of sclerenchyma cells consist of cellulose, hemicellulose, and lignin. Due to the lignin deposition in the cell wall, sclerenchyma cells die, destroying their protoplast. The principal supporting cells of plants are sclerenchyma cells. 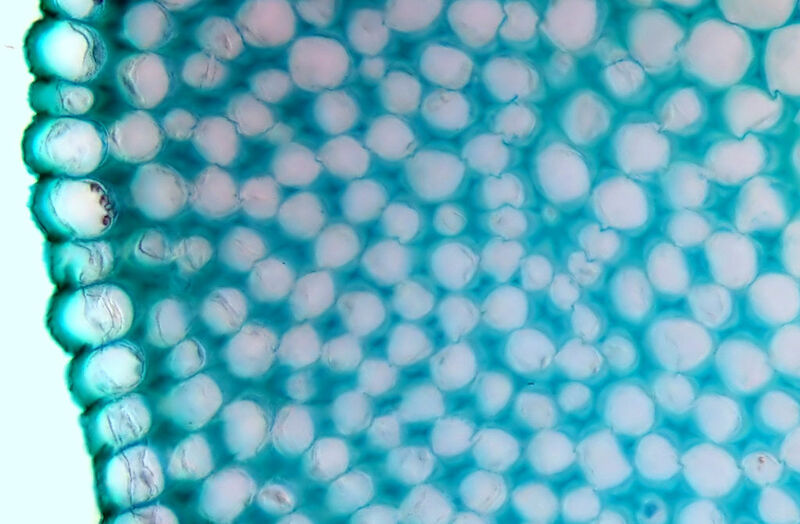 Sclerenchyma cells are found in mature parts of plants like wood. They are elongated cells, involved in the transportation of water and nutrients. Two types of sclerenchyma cells are found: sclerenchymatous fibers and stone cells. The sclerenchymatous fibers are long cells, tapering at the ends. The length of the sclerenchymatous fibers is 1-3 mm. They occur as bundles. These fibers are used in ropes, mattresses, and fabrics. Hard fibers are found in monocots like grasses. The fiber lengths of jute are 20-550 mm. Stone cells are also called sclereids. Their cell walls are extremely thick. The lumen of the cells is either spherical, cylindrical, oval or T-shaped. Sclereids are small bundles, which form durable layers like cores of apples and seed coats. Stem sclerenchyma is shown in figure 3. Sclerenchyma cells are shown in dark brown color in the middle parts of the stem. Parenchyma: Parenchyma cells are found in every soft part of the plant like leaves, fruits, bark, flowers, pulp and pith of the stems. Collenchyma: Collenchyma cells are found in petiole, leaves and young stems, appearing as a continuous ring beneath the epidermis. Sclerenchyma: Sclerenchyma is found in the mature parts of the plant like herbaceous perennials and woody plants. Parenchyma: Parenchyma cells are unspecialized cells. Collenchyma: Collenchyma cells are specialized cells. Sclerenchyma: Sclerenchyma cells are specialized cells. Parenchyma: Parenchyma consists of a thin cell wall. Collenchyma: Collenchyma consists of an unequally thin cell wall. Sclerenchyma: Sclerenchyma consists of a thick and rigid cell wall. Parenchyma: Parenchyma cell wall is made up of cellulose. Collenchyma: Collenchyma cell wall is made up of cellulose and pectin. Sclerenchyma: Sclerenchyma cell wall is made up of waterproofing lignin. Parenchyma: Intercellular space is present between parenchyma cells. Collenchyma: No or little intercellular space is present between collenchyma cells. Sclerenchyma: No intercellular space is present between sclerenchyma cells. Parenchyma: Parenchyma cells are isodiametric in shape. Collenchyma: Collenchyma cells are polygonal in shape. Sclerenchyma: Sclerenchyma cells are tubular in shape. Parenchyma: Parenchyma produces permanent tissues, which can achieve meristematic activity when stimulated. Collenchyma: Collenchyma produces permanent tissues, which can achieve meristematic activity when stimulated. Sclerenchyma: Sclerenchyma also produces permanent tissues, eliminating the ability of dividing. Parenchyma: Parenchyma consists of living cells at maturity. Collenchyma: Collenchyma consists of living cells at maturity. Sclerenchyma: Sclerenchyma consists of dead cells at maturity. Hence, their protoplast is absent. Parenchyma: Photosynthesis, storage of food, gas exchange and floating of aqueous plants are the major functions of parenchyma. Collenchyma: Providing mechanical support to the plant, resisting bending and stretching by the wind are the major functions of collenchyma. Sclerenchyma: Providing mechanical support, protection and transportation of water and nutrients are the major functions of sclerenchyma. Parenchyma, collenchyma, and sclerenchyma are the three types of simple tissues found in plants. Parenchyma consists of a thin cell wall, which is composed of cellulose. They are isodiametric in shape and found in all soft parts of the plant body like leaves, stems, bark, fruits and pulp. Intercellular spaces are present in between parenchymal cells. Parenchymal cells contain chloroplasts. They help in the exchange of gas and floating of the aqueous plants. Collenchyma consists of an unevenly thick cell wall, which is composed of cellulose and pectin. Edges of the cells become thicker by the deposition of pectin in them. Collenchymal cells are polygonal in shape. They are found in young parts of the plant body like stems, providing elasticity to plants. Little intercellular spaces are found in between these cells. Sclerenchyma consists of a hard, thick cell wall, which is composed of lignin. Sclerenchymal cells are dead at their maturity. They are tubular in shape and found in older parts of the plant body. These cells are involved in the transportation of water and nutrients throughout the plant. 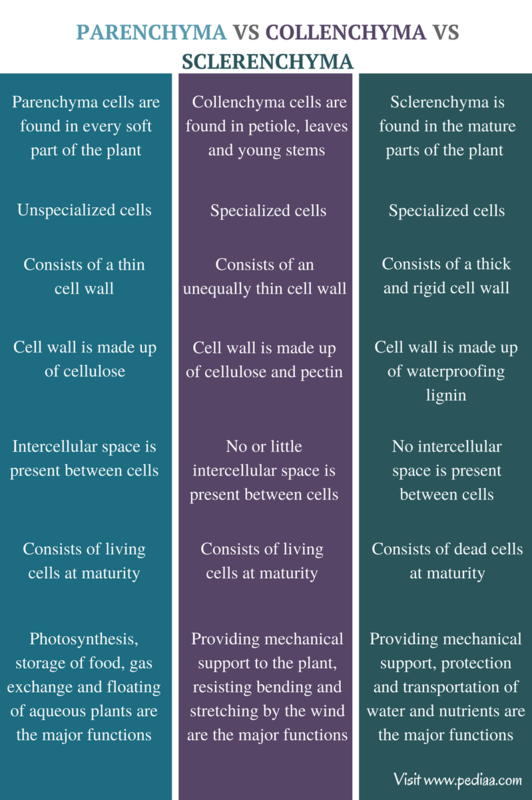 Therefore, the main difference between parenchyma collenchyma and sclerenchyma is their functions of the cells in the plant. 1. Shankar, T., “3 Types of simple tissues : Parenchyma, Collenchyma and Sclerenchyma.” PublishYourArticles.net – Publish Your Articles Now. N.p., 20 June 2015. Web. 14 Apr. 2017.